and can be used as a remedy for ailments from sore throats to burns and cuts. For a soothing drink for sore throats, mix honey with the juice of half a lemon, add boiling water and stir. If you’re feeling low, try a spoonful of honey as a pick-me-up. The fructose and glucose in honey are quickly absorbed into the bloodstream. Since ancient times, people already know the Benefits of Honey. Because the benefits of honey other than as a sweetener have been found through some research, the ancient people of the Vedic age consider that honey is one of the most extraordinary gifts of nature to mankind. Much research has been done to prove the health benefits of honey. For that, what are the health benefits of honey in Ayurveda? In honey, there is sugar in the form of glucose, fructose, and sucrose. Glucose is a sugar normally found in the blood of living animals, fruit juices and vegetables. Glucose has the task of returning oxygen replaced by lactic acid when the body gets tired. The fructose that has another name is sugar levulose, crystallizes more easily than glucose and can help in the construction of tissue. Then, sucrose is a combination of glucose and fructose. In honey also found dextrin or gummy substances in small quantities. However, if the honey is heated for commercial use, then most of the nutritional quality will be reduced. Honey is one of the best sources of energy and heat. Energy is produced from foods containing carbohydrates, and honey is one of the most easily digestible forms of carbohydrates. Because honey contains dextrin, it allows honey to enter directly into the bloodstream, so it can provide energy quickly to the body. Ayurveda is a health science originating from the Indian state known 5000 years ago and has spread across China, Tibet, Greek, Roman, Egypt, Afghanistan and Persia. Ayurveda is known as a science that deals with treatment using natural ingredients as its treatment medium, not only from organic plants, but also sourced from minerals such as sulfur to heavy metals such as mercury. Ayurveda also aids patient therapy by combining massage techniques. In addition, Ayurveda treatment is a holistic treatment that also includes the soul or emotional and spiritual life in the course of its treatment and is believed in overcoming beauty problems, chronic diseases, internal diseases, infertility, premature aging, and others. So, what are the health benefits of honey in Ayurveda? Honey is very easy to digest and assimilate. You do not have to worry about getting fat because honey is the best sweet food that does not cause flatulence and can prevent it to some extent, honey helps the performance of the activity in the stomach. Honey is also useful to prevent diseases of the stomach. Honey reduces the excess production of hydrochloric acid, thus preventing symptoms such as nausea, vomiting and heartburn. Ayurveda suggests consuming honey for those of you who suffering from arteriosclerosis and a weak heart. At night, our hard-working organs such as the heart require this energy intake. Ayurveda recommends drinking a glass of water containing honey and lemon juice before bed or when you wake up at night. According to Ayurveda, honey is perfect for those of you who experience heart pain and heart palpitations. Do you have anemia? Take the honey. Honey is the one of the Super Fast Anemia Treatments Naturally. Honey has a tremendous effect in the development of hemoglobin in the body, which is largely due to iron, copper, and manganese contained therein. Honey is used to treat anemia, because honey helps keep the hemoglobin and red blood cells well balanced. One of the health benefits of honey in Ayurveda, honey is considered very beneficial to support lung health and treatment for all lung imbalances. According to Ayurveda, a person with a respiratory problem, if he breathes the air in contact with honey, he will breathe more easily and deeper. This effect will be felt for about an hour or more. This is possible because honey contains a higher alcohol mixture than oil, and the vapor given by the air in contact with honey is calming and very beneficial for those of you who have asthma. According to Ayurveda, honey that has a 1 year old is the best honey to overcome respiratory problems. People also know about Health Benefits of Honey for Skin. According to Ayurveda, honey has a role in treating wounds. They claim that honey can soothe pain, act as an antiseptic, accelerate healing, and honey is also very effective for use in healing burns and carbuncles. You just need to apply it directly on your skin. Ayurveda also said that honey is very useful to treat cough. Honey, has a soothing properties on the mucous membranes that have inflammation in the upper respiratory tract and reduce cough and other troubling problems such as difficulty swallowing. In addition to the Health Benefits of Milk, honey can also be used to overcome insomnia. Honey can make you sleep soundly. Before going to bed, drink water that has been mixed with 2 teaspoons of honey, and get a good night’s sleep. In general, babies will fall asleep after they drink honey. Honey also has health benefits for the mouth, according to Ayurveda. If you apply honey to your teeth and gums every day, this will help your teeth and gums clean and make your teeth glow. Applying honey on teeth can help prevent tartar storage at the base of the tooth, thus preventing cavities. Honey is also useful in preventing the growth of microorganisms. In addition, honey can also increase vascularity in the gums. To overcome gingivitis, you can try gargling with honey water. Ayurveda also said that honey has good benefits for the eyes. If you apply honey on the outside of the eyes, this can affect the improvement of vision. 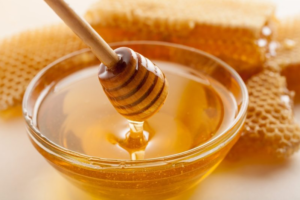 Honey is very useful in treating itching of the eyes, trachoma, conjunctivitis and other similar diseases. Consume honey (internal) and applying honey to the eye (externally) on a regular basis will help prevent glaucoma in the early stages of the disease. For those of you who are entering old age, you will get energy if you consume honey. Honey also dries out the phlegm and cleans the mucous system that is generally experienced by older people. Drink warm water mixed with 1 or 2 teaspoons of honey to taste the freshness and gain strength. How to use honey according to Ayurveda? If you combine honey with lime juice, it is a good treatment to treat internal glandural organ secretion. If you have insomnia, drink honey mixed with cold water. Water Jelai mixed with honey is a treatment to overcome the problem of constipation and indigestion. Honey mixed with neem or giloy juice extract or Daruharidra is believed to treat jaundice. You will get amazing benefits of honey if you consume it every day. Try it!